adorable cut through, I look froward to seeing this grow. Thanks. Slowly but surely. I like to do other projects along side. These ‘cut thru’ designs are fun. I love the ones you have already completed so I will be watching this one taking shape with interest. I’m so glad you’re backstitching as you go, it makes everything jump into focus beautifully! Yep, it’s all a blur otherwise. Designers are so clever! Nice to see that back stitch shows more detail. lovely. It brings everything to life doesn’t it? as always, your idea of cutting the chart into pièces is working for you, to make good steady progress. And great idea to complete backstitch as you go! 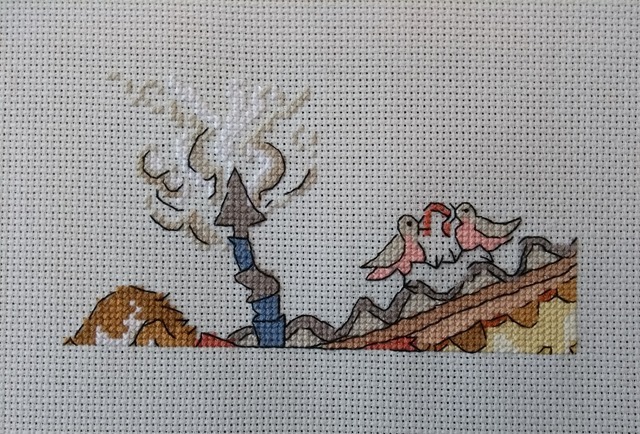 I don’t know how I could be bothered to do all the back stitch at once on the previous two. I must’ve had more patience a few years ago. I have no idea what cut through is but it looks very sweet. Cut Thru just means cross-section I suppose. If you Google “Bothy Threads Cut Thru” you’ll see all the designs are cross-sections of buildings or modes of transport. There’s loads of different ones. I’ve already stitched the camper van and the narrow boat and could happilly make them all. Yes, it’s nice to know I won’t have loads to do at the end. I think with this one you need to bs as you go, if left till the end I am sure you would lose the will to live whilst tackling it as there is obviously an awful lot of it. However it does make such a difference once its added. I left the back stitching until the end on two previous designs in this series and didn’t mind at the time. Now, I wouldn’t even think of leaving it for later. This is the way to go from now on for me. I love your “mini finishes” — and I love that you’re doing the backstitch as you go. The details on this piece are so wonderful — that lovely little light bulb filament! — that it will we a joy to watch as it keeps growing! This is really cute and I love the way you are stitching, one section at a time totally complete. I am trying to do that – I get sidetracked when I am using a color that also needs to be somewhere else – I go stitch that place as well! Ah, well the trick is to copy and then cut up the chart and only keep the bit you are working on nearby. That way you’ll only stitch what’s within that particular section. If I didn;t put the other sections away I’d be tempted to finish a piece of thread. Looks great so far. I’m sure you’ll be glad you did the back stitching now instead of at the end. Looks like there is a lot of it in this project. Absolutely. It’s been a lot of fun so far. This looks like quite a bit of progress and I love all the little details. Yep, it makes a huge difference doesn’t it? Wonderful start to your Cut through. I will enjoy watching this one come to life. Always love how that backstitch makes the design pop! Birds fighting over a worm is so cute too! Me too 🙂 Thanks Gun! The whimsical nature of the artwork is wonderful, and each new section is like a mystery unfolding. Love your approach and progress! Such a fun and cute piece, you’ve made great progress. The backstitching makes such a difference! I can’t wait to see this one grow. It looks like it’ll be a really fun piece. I like the cartoony style and could happily stitch on this until it’s done but I have other things to do as well.